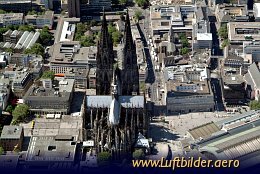 Cologne Cathedral is the third largest church in the world and one of the best known architectural monuments in Germany. Construction of the Gothic church began in 1248 and took with interruptions until 1880. On of the treasures of the Cologne Cathedral is the shrine of the Three Kings. The sarcophagus from the 13th century contains the remains of the Three Wise Men and is one of the largest reliquaries in the world.